To calculate the required number of aerocrete for building homes there is a simple method. But before count, you need to have a project in which the dimensions of the walls, both external and internal, dimensions and number of door and window openings, the number and height of floors, pediments, mansard floor. Also, you need to determine the type of block and its dimensions. For the calculation will be reviewed following project: the house is one storey with dimensions of exterior walls 6×9 m, height of the first floor is 3 m, an attic with a height of 2.5 m, the roof gable. Foam block for masonry in a single layer is applied with length, width and height respectively 625×300×250 mm. The main parameter of the foam block is its width, which is associated with strength and insulation. When choosing aerated concrete, consider the load on the unit and the climatic conditions in which you will apply this material. First you need to know how many square feet of walls available. The perimeter of all walls: (6+9)*2=30 Now you can calculate the area, knowing the height of the wall: 30*3=90 sq. m. Of the found value we must deduct the area of all window and door openings. Assume that the house contains 10 Windows with a total area of 18 square meters and two doors with an area of 4 sq. m. Thus, the total area of the walls is: 90-(18+4)=68 sq. m.
At desire it is possible to consider the so-called bandaging of angles. Have in mind that the area of the part of the unit, which falls at the junction of the two walls, should be attributed only to one of the walls. It is now possible to determine the number of gas-concrete blocks required for the construction of the first floor. The area is divided into the length and height of the block (it is important not to forget to translate millimeters to meters): 68/0,625/0,250=435,2. (by rounding have 435 units). Here, the aerated concrete can not count the pieces but in cubic meters by multiplying the area of walls, thickness of masonry, i.e. of the foam block: 68*0,300=20,4 cubic m.
Will be considered the attic is triangular in shape. Therefore, the area of the triangle is determined by multiplying the base by half the altitude. In this case, the height is 2.5 m, and the base (it is the same width of the house) is 6 m. so the area of one side of the attic is: 6*2,5/2=7.5 sq m, and two sides, respectively, 15 sq. m.
The attic can be triangular, circular, pyramidal, polygonal, symmetrical and not, etc. Therefore, when calculating the walls of the attic floor it is necessary to take into account the specific geometric shape. Now we need to consider existing attic Windows. Accepted area of window openings on this floor 3 sq. m. so, the total area of the walls of the attic floor will be: 15-3=12 sq. m.
Next is to calculate the number of gas-concrete blocks required for the construction of the attic: 12/0,625/0,250=76,8 PCs. (rounded to 77). Now it is easy to find the total number of blocks for the exterior walls of the house: 435+77=512 aerated concrete block. The resulting number is desirable to increase by 5% to compensate for battle with a chance of marriage or the necessary cut. This is true for the number of blocks on the inner walls. The project allowed that internal load-bearing walls are made of aerated blocks of the same size as the outer, and their total perimeter is assumed to be 12 m. the Area of load-bearing walls will be 12*3=36 sq. m. Number of blocks equal to 230 units (36/0,625/0,250=PCs. at $ 230.4). In the presence of door openings should be recorded. It remains to carry out similar calculations for the inner walls, not forgetting about the doorways. As a rule, in this case, the blocks thinner than the outer and supporting walls. If the calculation of aerated concrete is in pieces, it takes into account the length and height of the block. In the case of the calculation in cubic meters, you should consider the change in the thickness of partition blocks. This is due to the fact that such a unit is placed "squarely". In most cases, the price of gas blocks are for 1 cu. m. Therefore, things must be in Cuba. To do this multiply the size of one block on their total number. 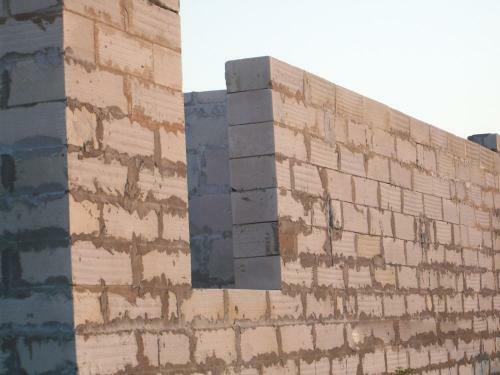 For example, for the exterior walls of the house will require concrete in cubic meters: 0,625*0,300*0,250*512=24 CBM Now, knowing the price per cubic meter of concrete, it is easy to determine the cost of 24 cube foam blocks. Concrete treat concrete and wire mesh is an artificial stone. It is manufactured with autoclave drying. In the solution for production in addition to cement, sand and water is added to lime and aluminum powder, which when a specific technology of production formed pores. Construction of aerated concrete is a cost-effective and produced in a short time. Features of construction of aerated concrete lies in the fact that from this material you can construct buildings, 2-3 floors and to make reliable high basement and ground floor. After the completion of the concrete must be isolated from moisture, as due to the addition of lime, the moisture can lead to the destruction of the material. To build load-bearing walls of the building, choose the brand of aerated concrete, specifically designed for load-bearing walls is D 1000 and 1200. All other brands on the density rather correspond to the production of thermal insulation works. But the higher density of aerated concrete, the lower thermal insulation characteristics. 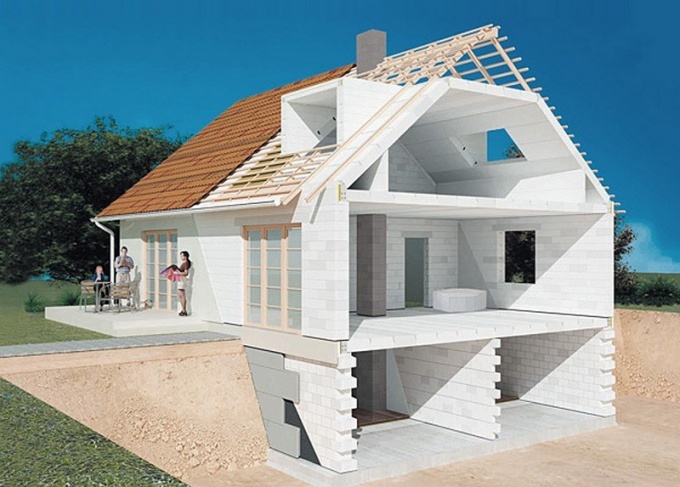 Therefore, immediately after the completion of construction of the house is necessary not only to isolate from moisture, but also to insulate. For walls of aerated concrete suitable for only two types of Foundation is a reinforced tape or solid tile. If you save on the Foundation, concrete wall burst up to the faults, because this material is fragile and therefore, to save on Foundation by no means impossible. If you decide to build a strip Foundation, then be sure to consider the condition of the soil. The pit needs to be dug below the frost, but above the groundwater level. In the construction of aerated concrete is especially important to consider. Inside a formwork, install a powerful reinforcement cage. Cement for concrete use only high marks. For fixing aerated concrete use reinforced screw anchors. Regular dowels that are used in the construction of walls of brick, will not work. After the erection of walls to just do the roof. Leave this step for next year is impossible. As already stated above, concrete is necessary to immediately protect from moisture. Obtyanite all exterior walls vapor barrier material and the top insulation. Inside the walls is also necessary to protect from moisture vapor barrier material. Everything else is as conventional construction.